Summer just wouldn’t feel like summer without a trip to Bar Harbor to enjoy all the splendor of this quintessential New England summer village. My parents started bringing me to Bar Harbor as a child. It was then that I first fell in love with Maine, a love that would transform my life and bring me to the state permanently almost two years ago. Bar Harbor is one of those magical places where there really is something for everyone. My dad is hardly an outdoorsman, but every single year he found plenty to see in the local shops and more than plenty to eat in the local lobster shacks. My mom on the other hand took us hiking, biking, swimming at Echo Lake…all things that a kid growing up in West Virginia could experience, but hardly on this level. I had never seen mountains touch the sea, in West Virginia mountains only touched the sky, but Downeast they touched the sea and the sky, and that spelled pure love for me. We took in many whale watches, where my oldest sister Melissa, prone to severe seasickness, would beg to be left on shore. They would assure her that this year she wouldn’t get sick, that she could sit in the middle of the boat, but she turned the most muted shades of green, and seemed to get sicker every year. It was three hours of hell for her, and a world of excitement for me. I fell deeper in love with the sea and Maine every summer. It was the thing I looked most forward to during my adolescent years. Maine was even more magical to me than Christmas and the first snow all rolled into one. So, needless to say, when Mark and I moved to Maine I wanted nothing more than to enjoy it whenever I could. Since it’s a three-hour drive from Portland, it doesn’t happen as often as I would like, but we have carved time out the past two summers to get away for three days and enjoy what is still the most beautiful (and memorable) place in the world to me. We arrived at our beautiful Bed and Breakfast The Graycote Inn around 9 o’clock at night. 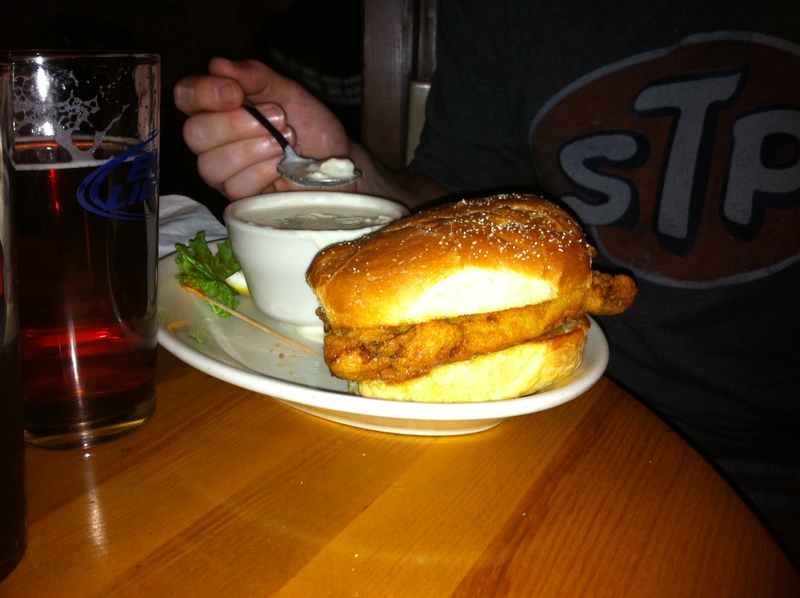 Since it was so late we took off for one of the restaurants in town that’s open late—McKay’s Public House. They serve a bit more upscale pub fare. Mark and I both tried their Pemaquid Stout (it’s exclusive to the restaurant). It was excellent. 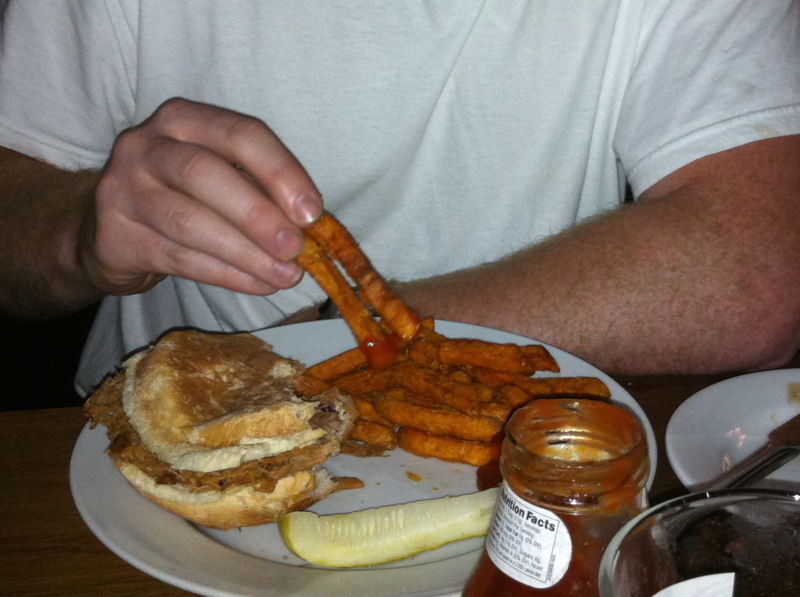 Mark had the Asian Pulled Chicken Sandwich with Sweet Potato Fries. 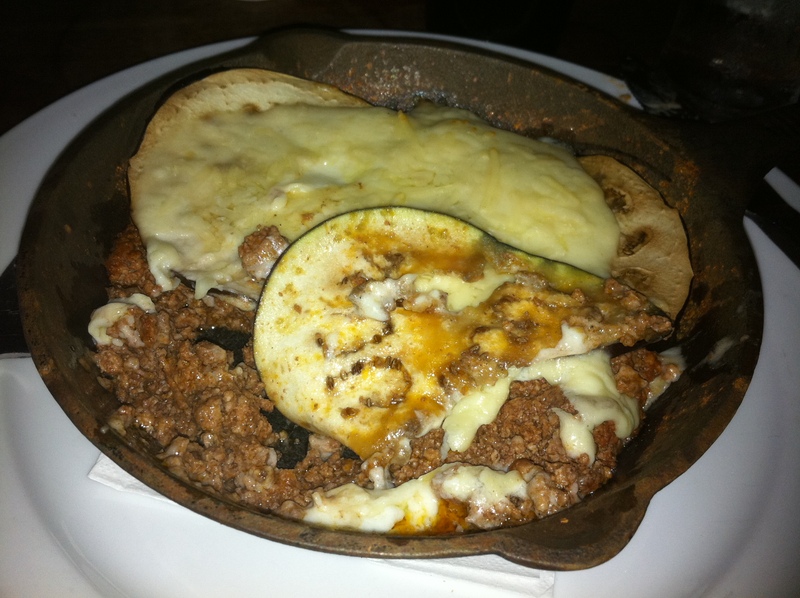 I had the Lamb Moussaka. 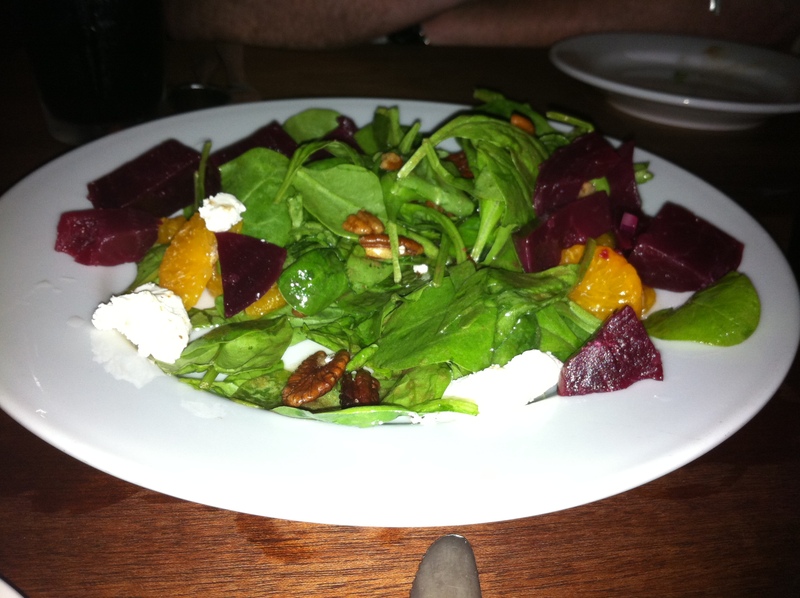 We started with the fresh beet salad with local goat cheese. Both dinners were okay, nothing incredible, but the salad was wonderful and I would definitely eat that again. Maybe if we had tried something from the specials we would have been more thrilled, but overall it was fine as it was one of the last places in town that was open. After that we were so drained from the ride that we went back to our cozy inn to relax. I must say the innkeepers have worked hard to ensure that everything is as eco-friendly as possible and in doing so have earned them the distinction of being the first business on Mt. Desert Island (Say it like a local tip: It’s dessert, not desert. Locals still use the French pronunciation.) to be certified as a green business. We woke up early to have our breakfast around 8:30. 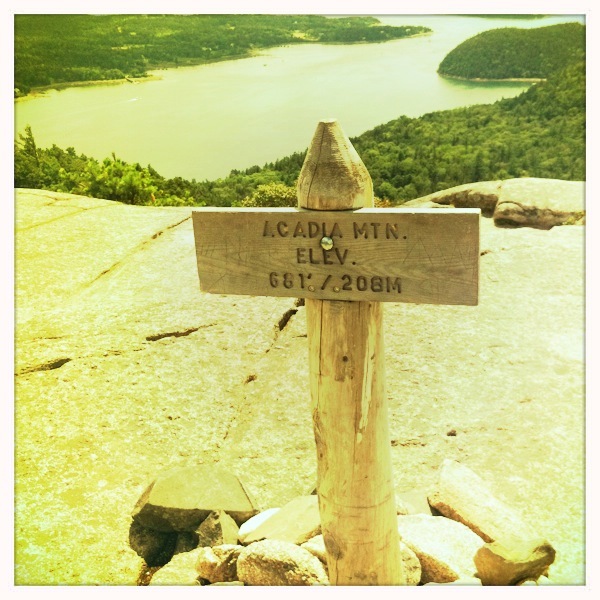 We wanted to get on the hiking trail to Acadia Mountain as soon as possible. Each morning of your stay at the inn a gourmet breakfast is served on the sun porch from 8-9. It is a healthy, filling and great way to start your day before heading off to Acadia National Park for hiking, biking, or just sightseeing along the Park Loop Road and Cadillac Mountain. That morning we were treated to coffee, fresh squeezed orange juice, fresh pineapple with basil, and finally oatmeal pancakes with Maine maple syrup. Delicious. After breakfast we took off for the trail. It’s located in Southwest Harbor right off route 102 three miles south of Somesville across the road from the parking area. It took us about a little over an hour at a leisurely pace. The views of Somes Sound at the top are amazing. Certainly nothing too strenuous, but it was quite warm out so it was a nice workout. Acadia Mountain with a peek at the view. After that we decided to head for lunch at Mainely Meats BBQ. This is something that can’t be missed by a southern girl living in the north! Owned and operated by Atlantic Brewing Company who produce my absolute favorite beer in the entire world—Coal Porter. All the tourists in Maine come for the Bar Harbor Blueberry Ale though and really, who can blame them? It’s quite tasty. Anyone can go on the free brewery tour and tasting then stop outside and grab a table for some southern style open-pit bar-b-que. We have done the tour and tasting before, so we just grabbed a seat. After the hike we were more than ready for some beers and grub. We both decided to have the pulled pork sandwich and I had my favorite Coal Porter and Mark had the tourist special to drink. It was every bit as smoky and delicious as places in the south and they have two sauces that you can add as much or as little as you like: one sweet and one spicy. We live on the edge and mix the two for one amazing flavor on the pork. 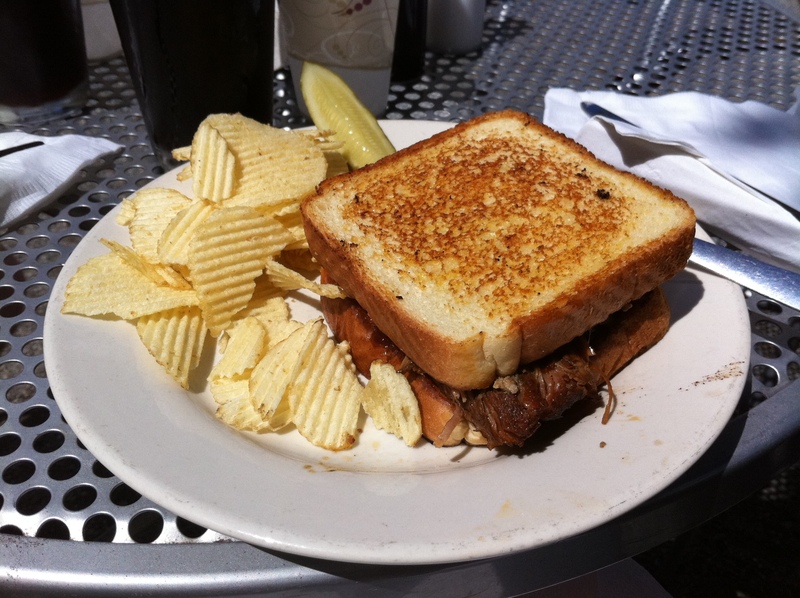 That combined with the grilled Texas toast they put the meat on and I was in complete heaven. Seriously, just leave me at the brewery. If you haven’t been here before it’s a definite must eat/experience. After that we had to head back to the inn to get ready for our Sunset Nature Cruise. It boarded at 7 p.m. for two-and-a-half hours of amazing wildlife sightings of harbor porpoise, harbor seals, osprey, and more bald eagles than I can count. Our guide Chuck was highly knowledgeable and gave us a run down of the lobstering industry in Maine. I would highly recommend this boat tour to anyone! You can even bring your own snacks, so we did some pre-dinner appetizers and wine on board. After that we decided to just grab some pub grub since it was kind of late and we were tired from a long day. We stopped in at The Thirsty Whale on Cottage Street. We both had Bar Harbor Real Ales to drink. 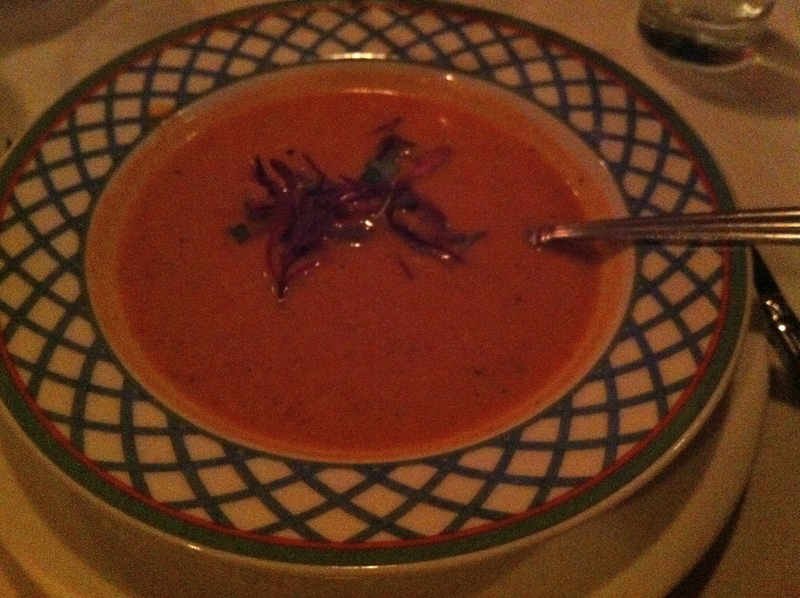 We ordered the New England Shrimp Chowder for an appetizer. 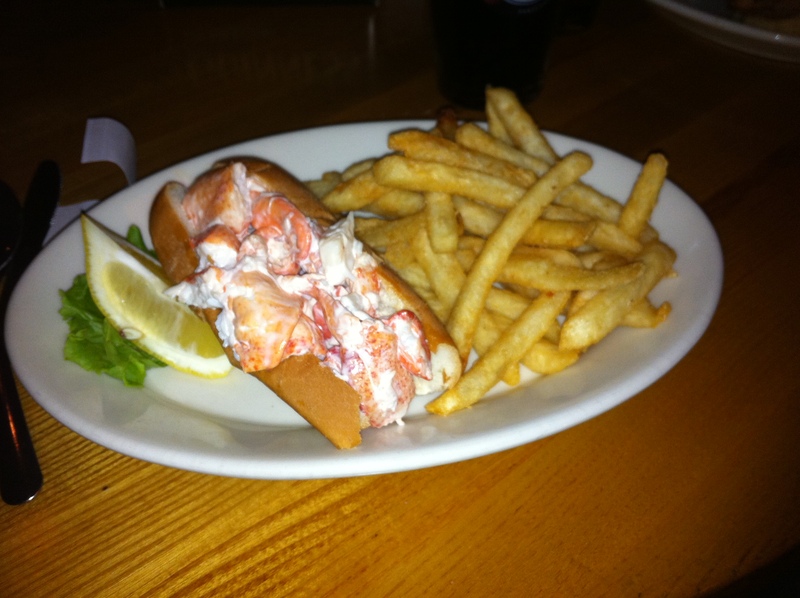 Our entrées were the Fried Haddock Sandwich for Mark and the Lobster Roll for me . Overall it was good pub style seafood. My lobster was definitely fresh and Mark’s fish sandwich was maybe the best we’ve ever tasted! I would highly recommend for a cheap meal out in town. Also known as Biking Day. We got up really early to get on the carriage trails early so we knew we’d be able to find a parking spot near the Jordan Pond House. We set off on our 15 mile trek on the Around Mountain trail which we started at Jordan Pond. 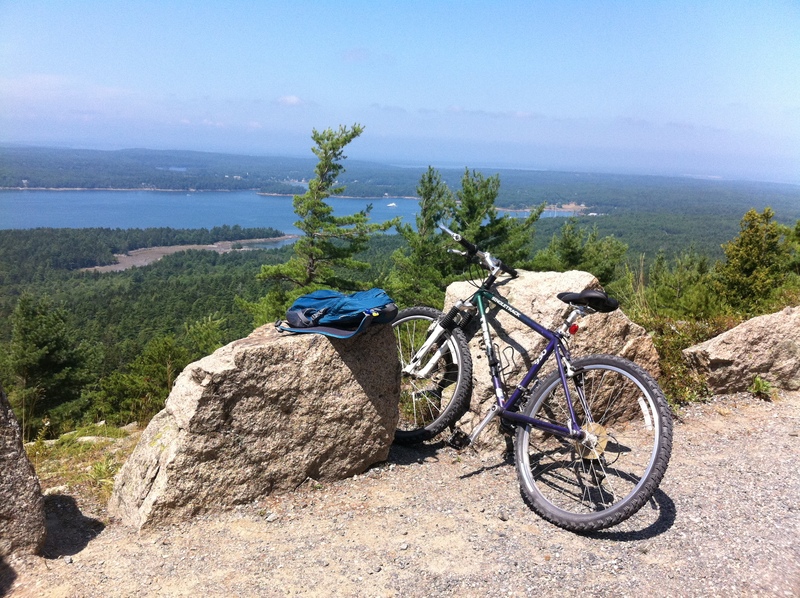 It’s an uphill climb with views of Northeast Harbor at one point and Somes Sound toward the end of the ride. It’s overall pretty strenuous, but if you are a pretty serious rider you shouldn’t have a problem. We left around 10:30 and finished around 1:30, but took many breaks for taking in the views and having snacks on the trail. After that we stopped in for lunch at the Jordan Pond House to try some of their famous turnovers (one comes with every meal). Mark had the Family Farm Ham and Cheese Panini and I had the Cranberry Walnut Chicken Salad. Mark also had a homemade raspberry lemonade. The popovers were definitely the star of the show and probably the only reason I would return. The other food was just okay, but they do use local ingredients here so that accounts for the slightly higher pricing. We went back to the hotel to get ready for our much-anticipated dinner at Havana. We ate here on New Year’s Day this year and it was the best meal I think I’ve ever eaten, so I was really looking forward to going back. When we arrived for our 8 o’clock reservation we were seated promptly and our waitress came over to take our drink order. 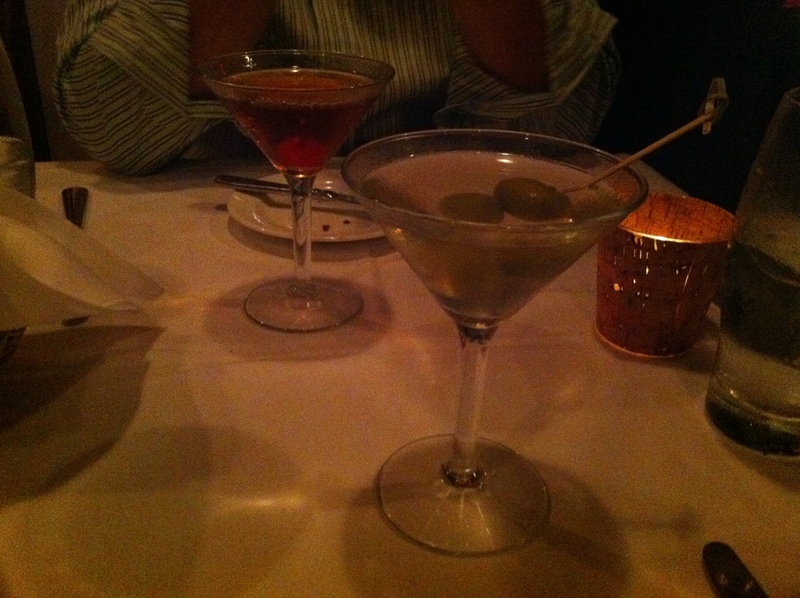 I started with a Cold River Vodka Martini, extra dirty and Mark ordered a Manhattan, perfect. We were both very disappointed when our waitress came back and told us it would be 15 minutes for our drinks (strike 1). So we decided to patiently wait and hear the specials and finally, order our meals. 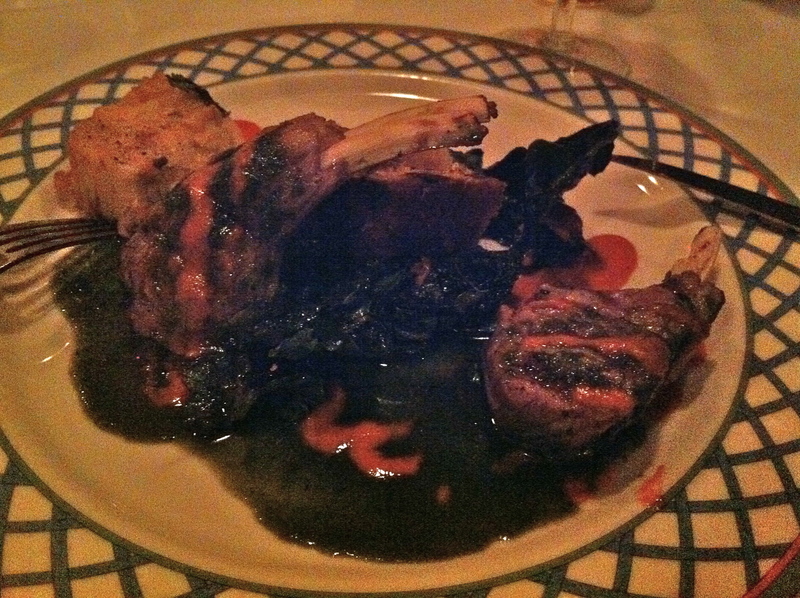 I ordered the Spicy Maine Crab Soup Appetizer and the Harissa Crusted Rack of Lamb for dinner. 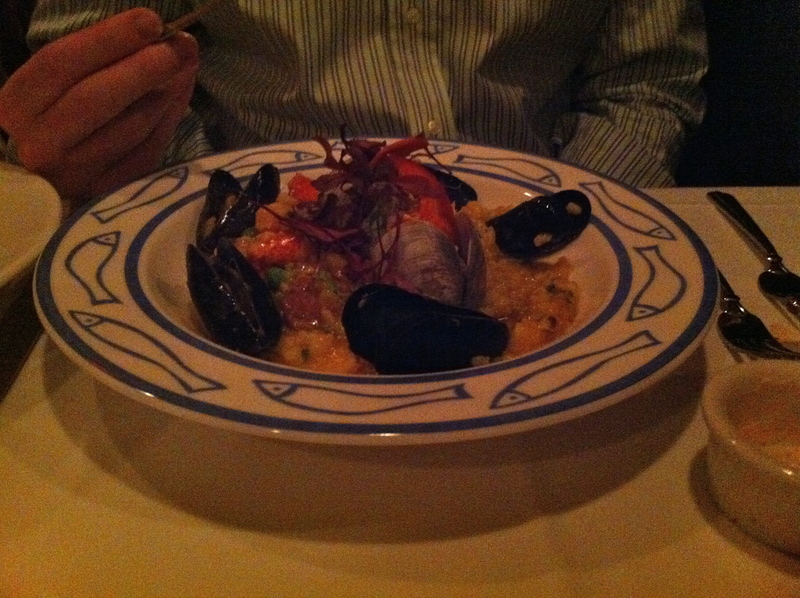 Mark ordered the Pan Seared Crab Cakes appetizer and the Lobster Paella. As on our visit before the flavors were bursting in our mouths. 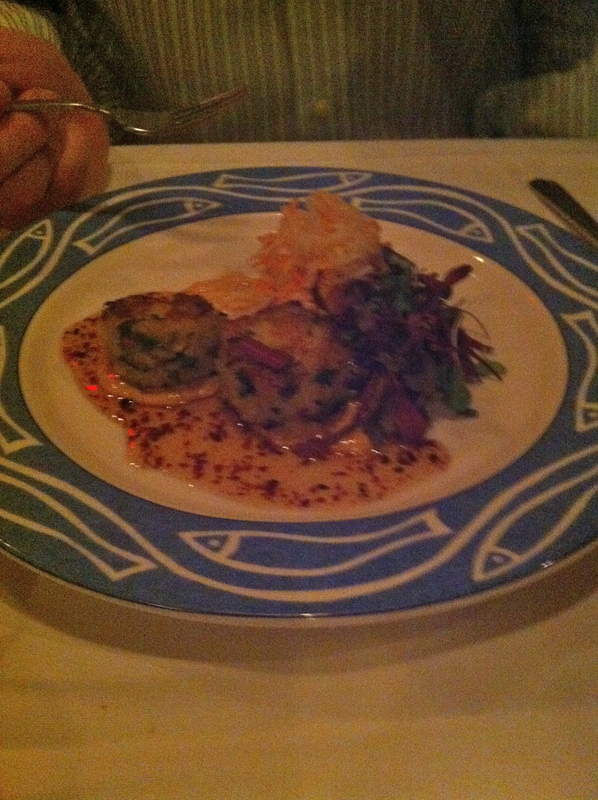 The crab appetizers were amazing and had the perfect amount of spice and latin flair. Then our entrées came. Mark’s was a vision of perfection, the lobster was so succulent and combined with the chorizo it was a dish fit for royalty. My lamb on the other hand was more suited for the peasants. It was cold when it arrived (strike 2) and I stopped the waitress to ask if this was a mistake. I mean, don’t get me wrong, the flavors were great, but a cold rack of lamb? I thought it was pretty ridiculous. She took my meal back and assured me that it would be remedied. Mark ate his entire meal before mine came back and my plate was a fraction of the entrée I had been given before. What?! I couldn’t figure out what was going on. I mean, it was hot and delicious the second time, but why the downsized portion? When our bill came I was ready to hit the roof. No deduction for my crappy meal and no deduction for the poor bar service (strike 3). We definitely won’t be eating at Havana again. It was a complete waste of hard-earned dollars that I can spend eating at another fine dining restaurant in town. Hitting up Mache Bistro next trip. Do yourself a favor and don’t patronize the Havana in Bar Harbor or Portland. We redeemed the evening with blueberry and coffee ice cream from Ben and Bill’s because I was still starving. It was a tourist trap, but excellent as always. Mark had coconut, because he’s a co-co-nut. We skipped breakfast at the inn today for our usual Sunday Brunch date. The Bar Harbor Inn does a Champagne Brunch in the Reading Room overlooking the harbor and we decided that would be a great way to spend our last morning. Don’t be fooled by the cheesy hotel decor, this brunch is serious business since they only have it the first Sunday of the month. It fills up quickly, so make reservations at least one month in advance. They have a roast beef and ham carving station, made to order omelets, pancakes and waffles, a smoked seafood bar, salad bar, dessert bar, fruit bar, and hot bar in the middle with fresh seafood dishes and things like eggs benedict and other great brunch items. It’s really a must do if you are in Bar Harbor the first Sunday of the month. We stuffed ourselves to the brim (after I practically starved to death last night) and I am happy to report that it was every bit as good as I remembered. Can’t wait for our next trip back to the island! Until then we’ll try to see what other places we can find to visit on the weekends.